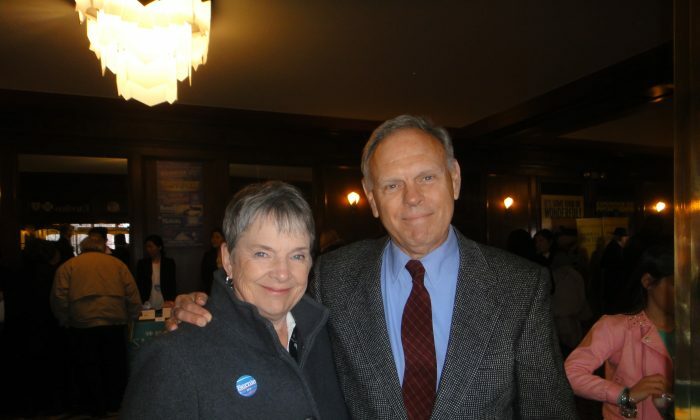 ROCHESTER, N.Y.—Over the years, the Myers have likely seen Shen Yun Performing Arts ten times as they have followed their daughter, once an oboist in the orchestra, to cities from Vancouver, British Columbia, to New York. But even though their daughter no longer tours with the classical Chinese dance and music company, the couple still attends at least annually. “We know it’s going to be very beautiful, and we care about Falun Dafa, and we care about human rights,” Beth Myers, a retired teacher, explained. Many of the Shen Yun company members are adherents of Falun Dafa, which upholds the principles of truthfulness, compassion, and tolerance. It was created to overcome evil with beauty. Unfortunately, the spiritual practice has been persecuted in China since 1999. But in 2006, a new performance company was born. Performing artists came together to found Shen Yun in New York to revive the traditional Chinese culture long repressed and nearly destroyed under Communist rule. Dr. Myers refers to this creation as a means “to overcome evil with beauty,” and knowing that the company began in 2006 and ten years later has established four full production teams astonishes him. Each of the dances and songs Shen Yun performs demonstrates the link between humankind and the divine, an underlying principle of traditional Chinese culture. Mrs. Myers, who sometimes plays the organ and piano at church and sings in the chorus, ran through a list of attributes she sees on stage: being the best person you can be, discipline, a belief in beauty, a relationship with nature, and the search for goodness. Shen Yun brings these qualities to life through stories, legends, and history spanning China’s 5,000 years of civilization, and through visiting far-flung regions of the country as well as trips to the bottom of the sea, to the moon, and to celestial kingdoms. “This expanse of time and space is just astonishing, actually,” said Dr. Myers, who is always grateful for the images of beauty left in his mind. Although she loves the beauty, for Mrs. Myers this year, she was left with a feeling of comfort. “That’s one of the things I love about this—the emphasis on goodness, on being the best people we can be. It’s a wonderful message,” she said.